Enthusiastic, innovative and unashamedly forward-thinking, Singapore is the epitome of Asia’s archetypal audacity and determination. Taking great delight in attracting the world’s open-mouthed gaze, this tiny island has managed to transform itself from a British trading outpost into a prosperous city-state that recently celebrated fifty years of independence. It may be a young nation in a hurry, but it also boasts a rich secular culture and a multi-faceted population. And perhaps it’s Singapore’s paradoxes that make it so beautiful: like its traditional 3-storey shophouses juxtaposed against sleek, modern skyscrapers nestled in the clouds in the background; or the mismatch between the made-to-measure millionaire businessman’s suit and the modest table which people dine at, such as the hawker’s stall or at a food court, those popular eating areas with their enticing aromas. The immigration that keeps this magnetic city moving comes from Malaysia, India, China and the West, as witnessed by the different neighbourhoods with their enduring, vibrant traditions. In Chinatown, a melting-pot of different customs live in harmony together, where you can visit the impressive Buddha Tooth Relic Temple, or the Sri Mariamman Hindu Temple. Along the river, near the colonial district and its inherited buildings, Clarke Quay is home to a vibrant nightlife scene and some impressive shopping centres. You'll find a tremendous range of shops to visit throughout the city, including the endless row of shopping malls which line Orchard Road: Ion, Tangs, Paragon and Takashimaya. There's also the iconic skyline of the Marina Bay Sands and its big wheel, the Singapore Flyer, which served as a dramatic backdrop of the annual Singapore Formula 1 Grand Prix. The nearby Gardens by The Bay, with their majestic Supertrees, Cloud Forest and lush plant life, represent this very green city’s designer side. As well as its many parks, Singapore is also home to an extraordinary Botanic Garden boasting an extensive collection of ginger varieties and orchids. 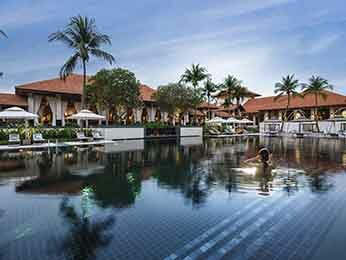 To continue your exploration of this destination’s flora and fauna, visit the Singapore Zoo and the amazing Night Safari, or the neighbouring island of Sentosa, a resort known for its greenery and plethora of peacocks, as well as for its delightful spas and the Universal Studios theme park. Singapore shows off its youthful past in rich cultural establishments such as the Asian Civilisations Museum or the Peranakan Museum, which celebrates this little-known eponymous culture. In a city that is constantly moving forward, science is celebrated at the Science Center and the ArtScience Museum. Last but not least, art is also well represented. Visible on the streets due to a well-developed patronage system, it can also be found in galleries and in shopping centres. 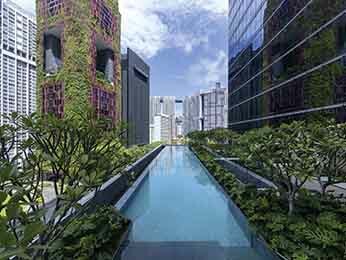 While the brand new Pinacothèque, the Parisian institution’s little sister, is packed with European exhibits, Asian talents are showcased in the Singapore Art Museum and the National Art Gallery, which opened in autumn 2015. The Singapore Art Fair, launched in 2014, shows that the city has every intention of establishing its international reputation in this field. Another major event in Singapore is the Singapore Food Festival, which was established in 1994. With so many great restaurants, street markets and food courts, it’s common for the city’s residents to spend more time dining out than within their own kitchens. There are plenty of leading French chefs represented here, such as Joël Robuchon, Anne-Cécile Degenne, at Xperience, and Julien Royer at Restaurant Jaan. Local chefs, such as André Chiang, Justin Quek and Willin Low, also fly the flag for a gastronomy scene that’s filled with all sorts of different influences. In Singapore, cultures collide in the street as well as on the plate. A melting pot of different cultures and religions, Singapore is home to many beautiful temples such as the Buddhist Buddha Tooth Relic Temple and the colorful Sri Mariamman Temple, Singapore's oldest Hindu temple. Enjoy the best aerial views in Singapore from these panoramic local landmarks: the elegant Singapore Flyer ferris wheel, the rooftop of the Sands SkyPark Observation Deck, the scenic Singapore Cable Car, or from the soaring 1-Altitude Gallery & Bar. Universal Studios Singapore is an action-packed adventure theme park for the entire family, located within Resorts World Sentosa on Sentosa Island. Don’t miss popular themed areas such as the Battlestar Galactica, Shrek and Transformers: The Ride. Attracting 1.6 million visitors each year, the Singapore Zoo is a verdant 28-hectare sanctuary which is home to over 315 species of animals. Make sure to also visit the neighbouring Night Safari and the Jurong Bird Park. Gardens By The Bay is one of Singapore’s most stunning urban outdoor recreation spaces, home to three waterfront gardens set across 101 hectares of reclaimed land. Make sure to visit the Conservatories, the Flower Dome, the Cloud Forest and the Supertrees Grove. Set upon Singapore's highest hill standing at 163 metres tall, the Bukit Timah Nature Reserve is one of the largest primary rainforests in Singapore with over 500 fauna species and 40 flowering plant species, making this an ideal local hiking spot. Singapore’s impressive Science Centre is guaranteed to intrigue and fascinate lovers of science, where its 14 galleries and its 20,000m2 of outdoor exhibition space and ecological garden are dedicated to the fields of technology, science and mathematics. The slightly more eclectic ArtScience Museum combines science with art. Set within a beautiful lotus-shaped building on the edge of Marina Bay, the museum is home to an eclectic mix of permanent and temporary exhibits, where Harry Potter movie costumes live alongside pieces inherited from the Mongol Empire, dinosaur replicas and art photography. Entry is free for children under 12 every Friday. Based in the former Tao Nan School since 1997, the Asian Civilisations Museum showcases the heritage of different regions of Asia that feed into Singapore’s immigration history. Shedding light on the country’s Muslim, Asian, Indian and Chinese heritage, the institution celebrates the cultures represented in the city’s different neighbourhoods. Stunning Buddhas, the Malaysian royal seal, fragments of the Kiswah from Mecca, and a Pejeng drum are just some of the exhibits on show throughout the museum’s 11 themed galleries. In the Singapore River gallery, you can marvel at the archaeological discoveries made in Singapore, bearing witness to the origins of the trading activities that have given the region its power. Established in 1887, the Singapore National Museum may well be the oldest museum in town, however this museum remains ahead of its time in terms of its museology. Set within a building combining glass with Neo-Palladian and Renaissance styles, you can learn about two aspects of the city: its history and the day-to-day life here. Marvel at the national treasures it houses, such as relics from the pre-colonial era, daguerreotypes and a portrait of Sir Frank Athelstane Swettenham (the premier Governor of the Straits Settlements) by John Singer Sargent. Occupying a special place in the heart of Singaporeans, the Singapore National Museum regularly hosts events and festivals including the innovative Singapore Night Festival. When it opened at the beginning of 1996, the Singapore Art Museum was one of the first institutions in the city dedicated to Asian art. Specialising in contemporary art, the museum showcases leading artists including Suzann Victor, Dinh Q. Lê and Cheo Chai-Hiang. Its extension, the SAM at 8q, boasts six galleries exhibiting contemporary art and is located in the heart of the city’s design neighbourhood. The National Gallery Singapore, opened in Autumn 2015 in the former buildings of the Supreme Court and the City Hall, presents a collection of 10,000 works of South-Asian modern art including engravings and sculptures, but also paintings from the Nanyang School, by the leading artists in Singapore between the period of 1950 and 1970. The Peranakans are sometimes referred to as “Baba-Nyonya”, a contraction of the Chinese word for father and a variation on the word “donha”, meaning woman in Portuguese. Their unique culture dates back to the 15th century when marriages started occurring between Malaysian, Burmese and Indonesian women with Chinese merchants. Adjoining the Asian Civilisations Museum, the Peranakan Museum is dedicated to these people and boasts a wealth of treasures: from an embroidered table decoration made with more than a million glass beads, to details from the rituals of a marriage stretching over twelve days and exquisite ceramics. Make the most of this opportunity to explore the expertise of this ancestral culture, with only 500 representatives remaining in Singapore today. Bathed in natural light, the glass building of the Marina Bay Sands is home to one of Asia’s largest malls, The Shoppes at Marina Bay Sands, home to over 1,800 stores selling the world's most prestigious international labels, along with up-and-coming brands. Within its endless shopping galleries, Christian Dior, Franck Muller and Tiffany & Co. rub shoulders with Anne Fontaine, Moiselle, Charles & Keith, Jimmy Choo and Jo Malone. Don’t miss the stunning “Vuitton Island” in the Crystal Pavilions, the monogram label’s biggest store outside of Paris. For a unique experience, hop on a sampan, a traditional Asian boat, and make your way along the canal inside the complex itself. With a skating rink, casino and all kinds of entertainment, there’s plenty on offer here to keep you busy for the whole day. 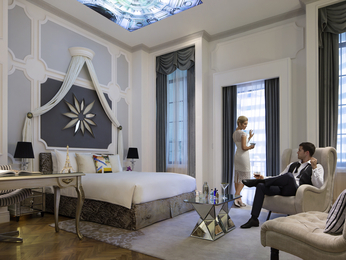 The Raffles Hotel, a historic colonial-style hotel built in 1887, is a jewel in the city’s architectural crown. There is also its iconic bar (where it’s customary to toss your peanut shells on the floor) and its impressive upscale shopping arcade. This legendary shopping destination is home to international labels such as Leica, Tiffany & Co and Louis Vuitton, as well as local designers. Choose between the ingredients for the famous cocktail, the Singapore Sling, and made-to-measure suits from the CYC The Custom Shop, the luxury tailor that dresses Singapore’s dignitaries. Located opposite Raffles, the Capitol Theatre is another historic monument. A temple to shopping and entertainment, this complex houses several prestigious brands which cannot be found elsewhere in the city, including Napapijri, Max.Tan and Marimekko. You’ll also find the famous Parisian tearoom, Angelina, which has also made its home here. Singapore’s colourful and vibrant Haji Lane pedestrian street was once the place where pilgrims came to pick up anything they might need for their journey to Mecca. Today, it's home to a string of hip boutiques and buzzing bars and restaurants. Offering appealing alternatives to the big international brands, vintage clothing stores nestle alongside small fashion designers, quirky homewares shops and “latte art” professionals. Continue your stroll along the nearby Arab Street and its surrounding area. It’s the perfect place to buy shimmering fabrics, such as traditional batik cloth from Malaysia and Indonesia, along with Middle Eastern cultural items such as prayer mats, and alcohol-free perfumes. Although it has been many years since Singapore's Orchard Road district was filled with orchards, a huge statue reminds us of the time when nutmeg was grown here. Nowadays, shopping centres have laid down their roots in its place. With its nod to the pagoda, Tangs department store paved the way in the 1930s. Following 3 years of renovation work, it recently opened a beautiful new hall dedicated to beauty. The neighbouring Mandarin Gallery department store showcases fashionable Singaporean labels such as Hansel and Jo Soh; close by, Takashimaya department store has a more international feel, with brands such as Christofle and Love Moschino. For lovely watches and jewellery from brands such as Vacheron Constantin, Rolex and Cortina Watch, make sure to visit Paragon department store, while the newest arrival, ION Orchard, shows off its futuristic curves and welcomes both streetwear and high-end fashion labels. A local tip: the shopping malls are joined by interconnecting underground walkways. With its 927 shutters painted the colours of the rainbow, the former police station on Hill Street known as the MICA Building is a striking local landmark. It is on the ground floor of this vibrant building that you’ll find ARTrium, an exhibition space dedicated to promoting and nurturing the visual arts of local and international artists. Set within the former English army barracks, the comprehensively restored Gillman Barracks cultural institution is also a popular place to visit in Singapore. With fifteen international art galleries (including ARNDT, Mizuma Gallery and Fost Gallery), a Centre for Contemporary Art (CCA) and several restaurants, the Gillman Barracks will fascinate lovers of art with its variety of exhibition spaces and galleries. One of Singapore’s most famous dishes is the rich and flavoursome Singaporean Chilli Crab. One of the best places to enjoy this local delicacy is at the lively Palm Beach Seafood Restaurant in Singapore’s Fullerton Road district. Celebrated as one of Asia’s best fine dining restaurants, Restaurant André delivers sophisticated French cuisine with a Mediterranean twist at the hands of chef André Chiang, who pushes the boundaries of creativity at his intimate restaurant. The bustling, family-oriented Pasarbella market brings together 30 food stores and market vendors selling delicious premium grocery delicacies. You’ll find the freshest meat, seafood, dairy produce, wines, craft beers and global cuisines on offer here. A foodie favourite dining spot, Australian chef Dave Pynt’s Burnt Ends restaurant is known for its perfectly-executed wood-fired cuisine with a gourmet twist. Don’t miss the signature oven-roasted Norwegian king crab smothered in garlic butter. Settle in for an evening of expertly-crafted classic cocktails and top shelf spirits at Jigger & Pony, one of Singapore’s best cocktail bars. With a fun and animated atmosphere, this intimate lounge bar delivers a fantastic night out in Singapore. The Populus Cafe is the brainchild of two of Singapore’s most celebrated baristas, Kang Yi Yang and Andrew Lek. A self-appointed “gastro-café”, The Populus Cafe serves delicious light meals to accompany its superb specialty coffee in a stylish setting featuring dark woods, mellow lighting and sleek chrome accents. Hong Kong experts The Coffee Academics showcase their expertise at this funky coffee hotspot in Singapore’s Scotts Square. With over 3,000 square feet dedicated to creating the perfect cup of coffee, the cafe is home to seven Sensory Stations, including an Espresso Bar, a Custom Blend Concierge and a Hand Brew Bar. Discover this world-class coffee haven. Inspired by Melbourne’s coffee culture, Singapore’s Candour cafe is a stylish haven with cool Metro tiling, a long countertop and excellent specialty coffee. With USB and power sockets found alongside each seat, Candour cafe ensures that you’ll always be connected while savouring their superb coffee creations and delicious sweet treats. Inspired by the romance of Italy’s Amalfi Coast, ilLido at the Cliff restaurant is an elegant coastal retreat situated in the Sofitel Singapore Sentosa Resort & Spa. Settle in on the terrace and enjoy panoramic sea views, or dine within the elegant Art Deco restaurant which brings to mind Italy’s sparkling coastline, with plush turquoise velvets accented by flashes of bronze and brass. Chef Simone Fraternali crafts authentic Italian flavours in the kitchens, creating a tantalising menu of flavours such as tagliolini with scallops and truffle, and the signature grilled octopus with roman artichoke. Arrive at sunset and enjoy breathtaking views accompanied by a sparkling glass of Prosecco, the perfect setting for a romantic evening in Singapore. Embark on a culinary odyssey at Xperience, the immersive dining concept of the glamorous SO Sofitel Singapore Hotel, which showcases the talents of one of the city’s hottest chefs, Trevor Ryann Paulo. Taking centre stage is Xperience’s twenty-foot oven, a custom-made creation by Molteni. Before taking a seat in the funky retro dining room, be sure to sip a creative cocktail in Xperience’s fashionable lounge bar. Chef Paulo’s avant-garde yet accessible approach to Modern European gastronomy with an Asian twist has made a signature dish of beef short ribs, while for dessert, the chocolate dome is not to be missed. Sit back and enjoy the exciting culinary show which is guaranteed to ignite the senses. Due to its tropical location, Singapore is generally hot and humid all year around. Temperatures are usually between 25 and 30°C. Keep in mind that rainfall can be frequent and heavy, especially in November and December, but usually brief. The best time to visit Singapore is from November to February, when the temperatures are cooler compared to the rest of the year. Transportation is easy to organise in Singapore, where the city offers a wide range of methods of transportation such as: local cabs, private car services, rental car, subway, buses, trishaws and ferry services. The Mass Rapid Transit (MRT) is the fastest and easiest way to travel around Singapore. The network includes more than 100 stations and is made up of 5 colour-coded lines: North-South (red), East-West (green), North-East (purple), Downtown Line (blue), Circle Line (yellow). Most trains operate from 5:30am until midnight. Single-trip tickets cost on average $2. Buy a Singapore Tourist Pass for $10 which offers unlimited travel for tourists on trains and buses around Singapore. The STP is available at the major MRT stations, such as Changi Airport, Orchard, Raffles Place. A 2 km Sentosa Express monorail links mainland Singapore to Sentosa Island. Buses are also very convenient to take you around Singapore, with an extensive network of routes and on-board air conditioning. Several companies manage local ferry services leaving from Tanah Mehra or Harbour Front terminals, taking passengers to islands located next to Singapore. Keep in mind that when driving in Singapore, you must drive on the left side of the road. Taxicabs are very popular in Singapore with more than 26.000 taxis operated by 6 major taxi companies. Taxi can be hailed on the street (except in the city center), found at taxi ranks or booked in advance through one of the numerous Singapore taxi companies. Keep in mind that it can be difficult to find a taxi in Singapore between 4pm and 5pm when drivers change shifts. The initial charge is around $3.00 and then every 400 meters is $0.22. Many additional charges may apply, such as night fare, public holidays, airport trips etc. Credit cards are usually accepted, with a 10% additional fee. Changi Airport is located approximately 20 kilometers from the center of Singapore. Metered taxis are available and private transfers can be arranged at the airports. By cab between Changi Airport and the center of Singapore, expect a 20 minutes journey and a fare of $25 (depending upon traffic and the time of day). For $2, MRT public transport is also a convenient alternative, with trains every 10 minutes and a journey of 30 minutes to Central Singapore.